Our private guest suite spreads over the whole first floor of our home and sleeps 1-4 guests. We only have one party of guests at a time, so you will not be sharing with anyone. 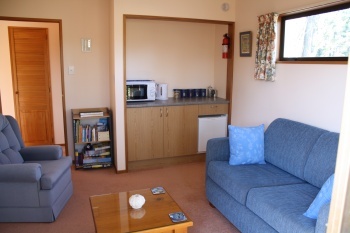 The suite is well decorated, warm, sunny, comfortable and peaceful. It has 2 bedrooms, a full bathroom, lounge and its own private balcony which is a great place to soak up the sunshine, see the sunset and stars, and listen to birdsong. There are wonderful views of the garden, paddock and orchard from every window. 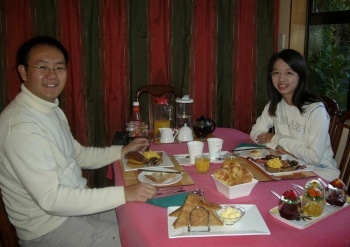 The tariff includes breakfast in our sunny breakfast room. You can choose a tasty and satisfying meal from a menu of cooked/continental choices. Children 3-12 years NZ$40. Children over 12 years NZ$50. Please check our online booking system for exact pricing and vacancies, or email us for further details. Guests arrive between 2pm and 9pm on their day of arrival, and leave by 10 am on their day of departure. 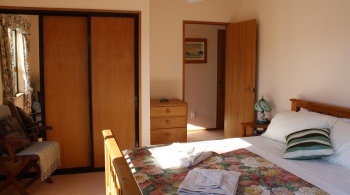 Both bedrooms have good quality, comfortable beds with electric blankets, heaters, mirrors and radio alarm clocks. A hair drier is also provided, and you can use our laundry by request. The queen bedroom is a lovely sunny room with good wardrobe storage and a patio door opening onto the balcony. You wake up to the sound of birds and a view of the garden. 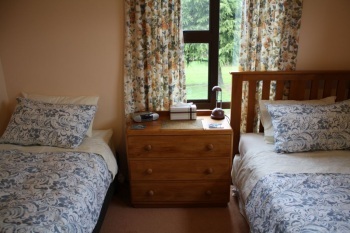 The twin bedroom is an attractive, cosy room with king single bed, a single bed and a long window overlooking the house approach and plum orchard. Room safe for passports etc. The guest lounge has everything you need for comfortable relaxation with both an armchair and settee, which converts to a comfortable double bed if needed. 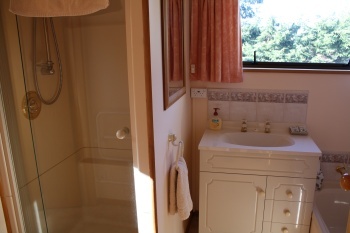 The bathroom has bath, shower, heated towel rail and separate toilet. Toiletries and towels are provided and there is an electric shaver point. 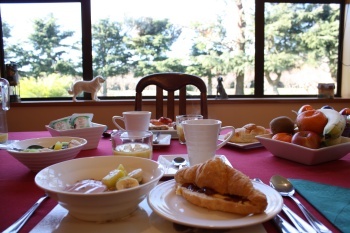 You can look out over the orchard as you enjoy a tasty and generous breakfast in this lovely sunny room. We use our own eggs, home-made preserves and local produce, and will serve your choices from a varied continental/cooked menu. Complimentary Wi-Fi is available, and a notebook for those guests without their own computer.